Owners of the newly release 13- and 15-inch Retina MacBook Pro models may want to fire up Software Update for something even more important than a fix for Mail in Mavericks. Firmware updates for both models also released on Thursday take care of some potentially big problems with these latest laptops. MacBook Pro Retina EFI Update v1.3 fixes an issue with unresponsive keyboards and trackpads on the 13-inch Retina model. Apple previously acknowledged the problem and promised a fix back on Halloween. MacBook Pro Retina EFI Update v1.2 for the 15-inch Retina MacBook Pro resolves an issue that—in rare cases, according to Apple—limited the performance of the discrete graphics processor after a system wake or boot. All three updates are available now via Software Update. While we like the improved performance and battery life, the 128GB of storage and the 4GB of RAM may not meet your daily requirements. With its fast processor, spacious storage, and 8GB of RAM make this model of the 13-inch Retina MacBook Pro a portable powerhouse. 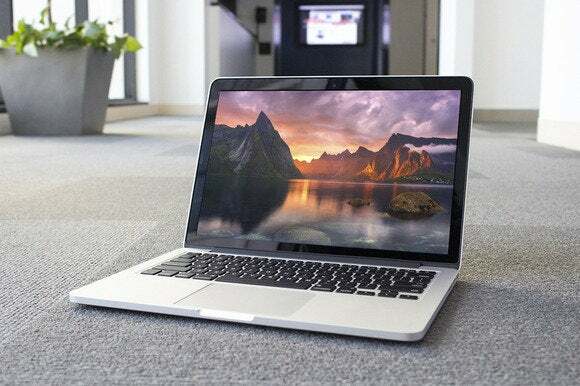 While the $1999 15-inch Retina MacBook Pro offers a nice boost in battery life and fast flash storage, its lack of a discrete graphics processor prevents it from being all that it can be. The $2599 Retina MacBook Pro epitomizes the idea of a pro laptop, combining top performance and excellent battery life.